EdisiViral : Big question: When will Skybridge in KK open? Big question: When will Skybridge in KK open? Chin pointing at the yet-to-be opened Skybridge that is causing obstruction to the public. KOTA KINABALU: Sabah Progressive Party (SAPP) has urged the authorities to resolve the Skybridge project dilemma as soon as possible. 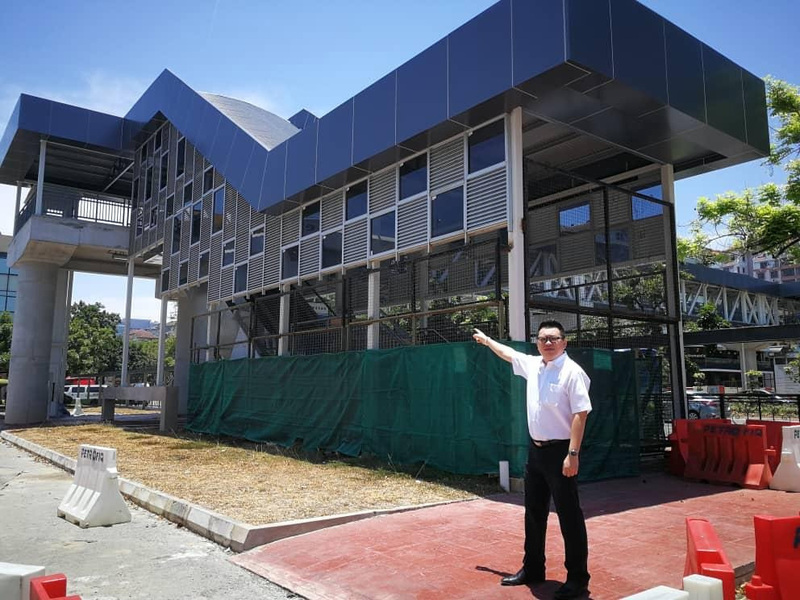 Its information chief, Chin Vui Kai claimed that Kota Kinabalu Member of Parliament Chan Foong Hin never seemed to make any effort to resolve the Skybridge limbo. He said Chan had last year brought a group of DAP assemblymen to the project site to raise the matter, but had one silent on the issue with no solution in sight. The project undertaken by Petrofiq Sdn Bhd was said to be 94.5 per cent completed with only some minor works left but the contractor has yet to receive outstanding payment amounting to RM20 million which is 65 per cent of the RM31.5 million contract value. The developer for the skybridge project, Sunsea Development Sdn Bhd, which is also the developer of Oceanus Waterfront Mall, was declared insolvent in April last year. Chin urged the DAP KK MP who promised to look into this matter to pursue it with UKAS (Public-Private Partnership Unit) which is a federal government agency. He also asked why State Tourism Minister Datuk Christina Liew, who is Api-Api assemblywoman, is leaving the matter hanging for such a long time. Chin stressed that the initial intention to build this overpass was to prevent accidents involving pedestrians crossing the road. It also serves as an attraction to tourists as well. He said members of the public, especially those residing and doing business at the area, are asking when they can actually utilise the skybridge, a 350-metre pedestrian overpass which connects Oceanus Waterfront Mall, Warisan Square, Api-Api commercial centre, Centre Point Sabah and Asia City. It is equipped with air-conditioning, as well as allows for mini shops and convenience stores. Chin said the public want to know what the YBs and government are doing about this project. There are complaints that instead of making it safe and convenient for the large number of pedestrians crossing the roads, especially between Api Api Centre and Centre Point Sabah as well as Asia City, the structure has been causing obstruction to the public, resulting in them being exposed to safety risks. Big question: When will Skybridge in KK open? Borneo Post Online.